Emma Cannon is one of those rare practitioners who is extremely knowledgable, yet she never imposes her views on her patients. She listens, she treats and she makes suggestions but ultimately it is up to you to decide how you want to proceed forward. On a sunny morning I popped into Emma’s treatment room, a short minute walk from Sloane Square tube station and just looking at Emma’s beautifully serene face made me smile. She is calm and nurturing and so is her treatment room – it is like a peaceful oasis of tranquility in the middle of a busy city. Somehow when the door closes behind you, the stress seem to melt away and you feel relaxed and ready to have ‘me-time’ that is so important, yet so lacking in our day and age. Over a cup of one of Emma’s delicious teas ( woody, reflective ) served in a pretty porcelain cup Emma and I caught up on our lives. I mentioned a recent article from Elle, by Victoria Coren Mitchell about Apple and Facebook initiative to offer money towards ‘fertility preservation’ aka ‘egg freezing’ to women who work for them. Victoria actually went on to say that ‘my instinct is that the key to true liberation actually lies with egg freezing’. My opinion on the subject isn’t that straight-forward but that’s the beauty of what Emma does in her clinic – she uses her knowledge and looks for the best solution for you. When it comes to female fertility the subject still often remains a taboo or is spoken in hushed tones, yet many celebrities think nothing of shoving their private parts in our face from the pages of the magazines. Or take the subject of pregnancy – if a couple fails to conceive the nod often goes in the direction of a woman, forgetting that it takes two people to get pregnant. It’s not just the physical process, to me there is a little bit of magic that is also involved. But forgive me, I veered off course a little. 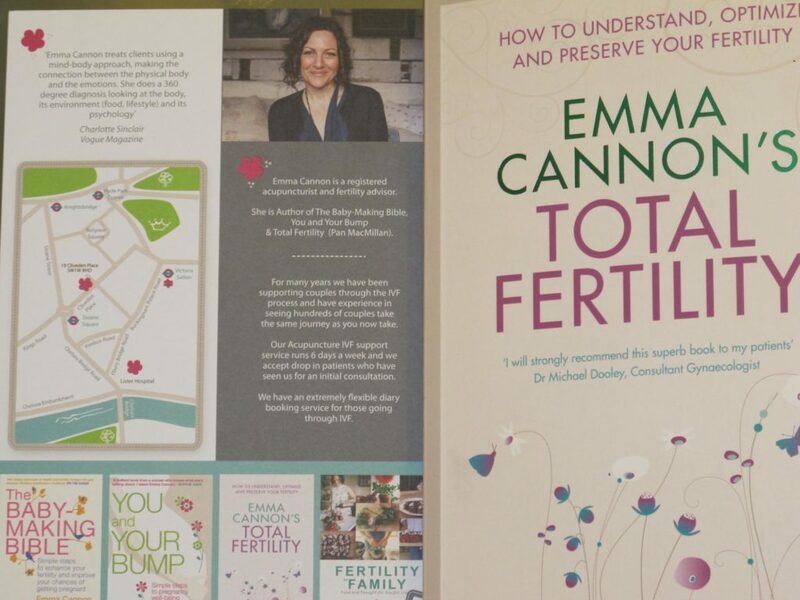 Emma has written several books ( a dear friend of mine who struggled to conceive after trying IVF actually succeeded after I sent her Emma’s book – she implemented some nutritional and lifestyle changes and is a mother of a beautiful child that made the family complete ), her latest is called ‘Total Fertility’. In it Emma addresses such important subjects as male and female fertility, getting yourself healthy in order to conceive, as well as managing your fertility. Women are born with a certain amount of eggs which diminish over time, from the moment we start having periods. With age egg quality is also known to decline but I actually want to focus on something that a lot of us don’t think about. We might know our medical history but how often to we know our family’s fertility history? As we grow up we have certain intimate conversations with our mothers ( or fathers or with both parents on different aspects ) and I think they need to involve issues that shape us through our genes. As Emma says ‘ We are not powerless. To be warned is to be armed, and if you know your mum had fibroids in her thirties, for example, that is powerful knowledge. Equally, ask yourself what emotional tendencies she may have passed on to you.’ It’s not about judging one another, it’s all to do with knowing yourself and trying to complete the pieces of the puzzle. This book makes for great reading for women in their 20s, 30s and 40s and I hope in some way it will open up minds and help us to let go of things that hold us back. Emma sees women of different ages in her clinic, including teenagers and I hope by helping mothers and daughters build an open dialogue from early on, Emma and her book will help us be better mothers, who help their daughters along the way on the journey from girlhood to womanhood. Every few weeks Emma and I will choose a topic to discuss and I will publish our Q & As, so if there are any subjects that concern you that relate to Emma’s work, please leave them as a comment to this post or e-mail me on galina@galinka.co.uk. We both would love to engage with you and build an interesting discussion on the subjects that matter to you. Such a fascinating, complicated topic and one as you say that is rarely talked about. Dearest Nic, that is music to my ears and I am sure Emma will be very happy too. It is a wonderful opportunity for women to have an open forum and for Emma to share her knowledge so women who do want to have children now or in the future can make educated choices and hopefully spend less time worrying. When we make educated choices, instead of searching for things in the dark, it leads to better results. I look forward to learning and discussing a variety of topics, the first one being Gut Health & Fertility. Please send us questions if you have any, so I can compile a comprehensive list for Emma. Thank you for your comment and for sharing Charlie. We live in a world with lots of pressure and stress placed on both men and women and sadly conceiving a baby and carrying him or her to term is often not a straight-forward process. I hope that by sharing Emma’s experience and wisdom and having an honest discussion with women ( and maybe men as well ) we will help women to make decisions that will help them navigate the treacherous path. Being a woman is a job in itself and I am glad that we will have an honest and all-inclusive forum. Emma is always honest but she never forces decisions of those that come to see her, which is probably one of the secrets she is so successful professionally, as well as on a human level.